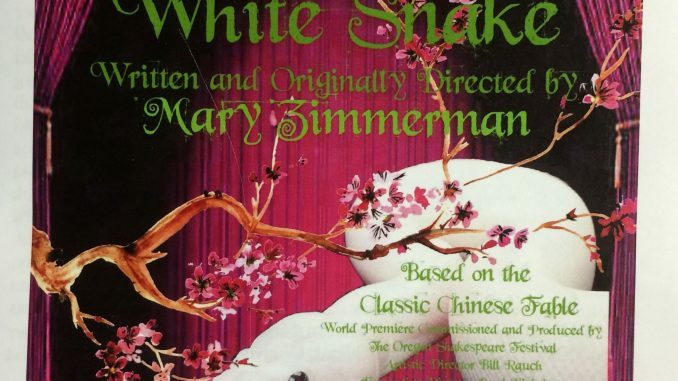 The White Snake, a play originally written and directed by Mary Zimmerman, is an hour and 40 minutes of entertainment that focuses on accepting differences in relationships. Based on a traditional Chinese fable, it follows the story of White Snake, played by Samantha Kelly, a spirit who studies magic for years, in hopes of becoming immortal. She masters the ability to take on the form of a woman, just like her spirit friend Green Snake, played by Abigail Radwick. Green Snake tempts her to indulge her curiosity about the mortal world and both decide to go down the mountain for just one day appearing as women. Once there, Bai Suzhen (White Snake’s fake mortal name) and Greenie (Green Snake) meet Xu Xian, played by Ty Moylan, who is a poor pharmacist’s assistant whom Bai Suzhen falls in love with. Eventually they marry, open a prosperous store together and have a child. Greenie decided to remain as Bai Suzhen’s servant and friend, trying to help keep Bai Suzhen’s true form a secret. Fa Hai, a Buddhist monk, played by Stephen Walker, reveals to Xu Xian his wife’s true identity, causing a spin of disastrous events and tests of their marriage. In the end, Xu Xian’s love for Bai Suzhen allows him to accept her true form, and she gives birth to a snake child. Although staying with Xu Xian means Bai Suzhen gives up her quest to become immortal, the play ends happily with the loving family remaining together. One aspect of this play that stood out to me was the fantastic costumes created by hand for this play. The traditional Chinese kimonos were elegant. Bai Suzhen’s kimono was wrapped around her dress and was connected at the waist to be form flattering, making her look regal. To portray Bai Suzhen and Greenie in their snake forms, both puppets and traditional oriental umbrellas were used. The puppets were multiple green or white cylinder shapes strung between two wooden sticks. One of the sticks was held lower to the ground, while the other was higher, as if the snake had her head up while slithering along. When using the umbrellas to represent the snakes, multiple people would hold open umbrellas to the side and spin them to represent the movement of the snake’s body. The head was a partially closed umbrella that would lead the trail of other people representing the snake’s body as it moved around the entire stage. Using umbrellas to represent the snake was actually a beautiful way to show its movement and made it easy to imagine a large snake. At first I did not realize the puppets were supposed to be the snake, but it was a creative way to represent when the characters were in snake form and not moving very much. The actors truly embodied their characters, making sure you could not miss the emotions they were portraying. It was easy to see Bai Suzhen’s dedication to becoming immortal in the beginning and her growth into a dedicated and loving wife. During the play, Greenie did an excellent job as being a witty and loyal friend to Bai Suzhen. At times I found Xu Xian to be a bit manipulable, as he was tricked by Greenie and Fa Hai in two different instances and was easily convinced to marry Bai Suzhen even though doubt was pulling at him. Throughout the play, narrators would interject with directions about how a character is supposed to behave as they do those actions, telling the different ways the fable had been told in the past (which influenced what the actors did) and served as transitions from scene to scene. Each of these interruptions occurred at least twice.While their interactions with the characters were often meant to be funny, I found it distracting and felt that it detracted from the play. Where tension could continue to build in order to create a captivating moment, we were pulled away from the plot sequence with jokes that did not seem to bring a big reaction from the audience. Other than the awkward attempts at humor, I really enjoyed watching this play. Before this I was not familiar with any Chinese fables and felt it portrayed it in an engaging way. The actors did an excellent job mastering the music, as well as the dancing and fighting choreography that takes place.